Meet Katrina: BREAST CANCER, We Need More Than Pink. A woman with Li-Fraumeni Syndrome has almost a 100% chance of getting cancer in her lifetime. Although most of this risk is due to Breast Cancer, LFS women can develop cancer almost anywhere. When cancer metastasizes, spreading from the original tumor to other locations, it is no longer curable. For many women, with LFS and without, the threat of cancer recurrence is terrifying and very real. For these women, pink represents that threat. Here we are again in Pinktober. This is the reality of Breast Cancer: it means facing your mortality. Katrina and her Big Brother. I was 30 years old when my big brother was hit by a truck while riding his bicycle for his Bike Messenger business in 2008. I remember the moment I heard, I broke. I stood over my toilet heaving, crying and bellowed “WHY! 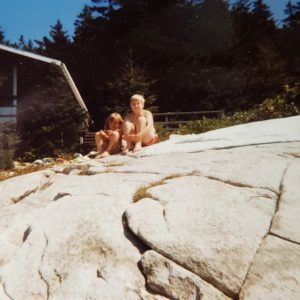 ?” Mourning my brother in the days to follow, I should have been able to reflect on how broken I was losing him and supporting my little 7 year old through this loss. Instead I was robbed. I was robbed of processing all that we were feeling and experiencing. I was robbed because as I sat two days after his death, I felt pain in my right breast and I felt a lump. I immediately called my doctor and with an explicit voicemail explained as I yelled into the phone I just lost my brother and now I found a f-ing lump and it f-ing hurts and I need to be called back immediately. I had a return call and was put on what I refer to as “The VIP list you are glad you are on but wish you never had to be”. This was the beginning of my fight. 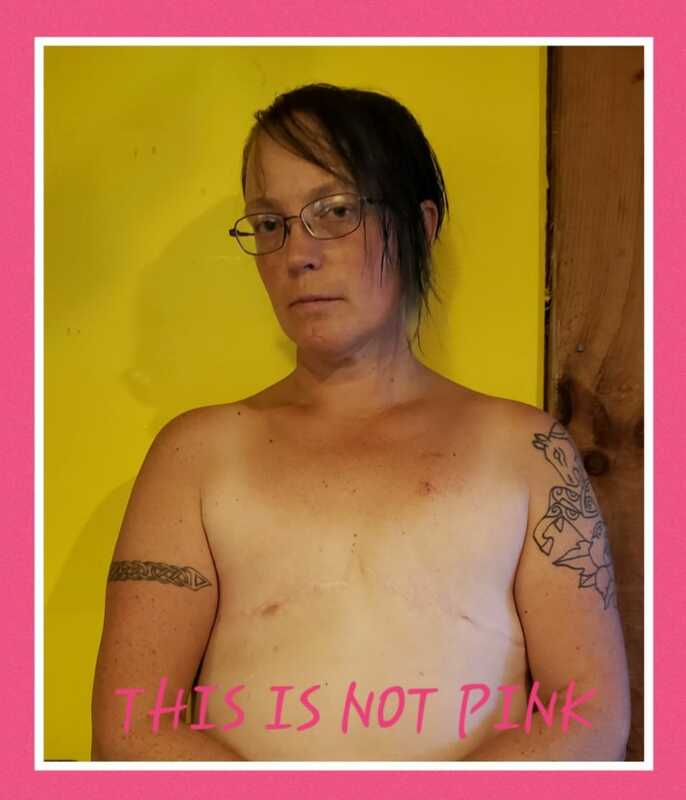 I have had breast cancer twice, 7 surgeries including a lymph node dissection, 16 chemo treatments, 30 radiation treatments and taken countless medications. I had a double mastectomy and chose no reconstruction, followed by a hysterectomy. I have a genetic mutation in the Tp53 gene, Li-Fraumeni Syndrome that gave me nearly 100% chance of developing breast cancer in my life and a high risk of having multiple primary cancers in my lifetime. I passed this mutation on to my children. We have to be monitored in hopes to be able to find any potential cancers before it is too late. These scars tell a story, my story. I am only one person. ONE IN EVERY EIGHT WOMEN will develop invasive breast cancer in 2018. 40,920 women in the US are expected to die in 2018 from Breast Cancer. 113 people die each day from Metastatic Breast Cancer in the US alone. It is Stage IV, Metastatic Breast Cancer that kills. 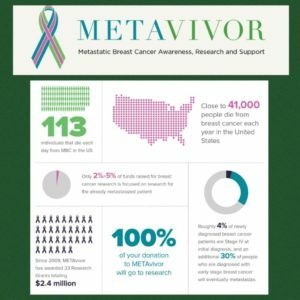 2-5% of all research money raised goes to funding Metastatic Breast Cancer research. I have friends who are fighting the fight who are praying daily that a cure will be found before they lose their life to Metastatic Breast Cancer. Even in 2008, ten years ago, I was fully aware of Breast Cancer. This being Breast Cancer Awareness Month I have always felt a bit unsettled because of all the pink. As I watch friends fight and friends die from cancer the pink everywhere REALLY is getting to me. I really appreciate all fundraising that does something to benefit research or people actually going through Breast Cancer but please check the organization that is being funded. When you buy something that is pink or has a cute pink ribbon, know that there are MANY companies that use this month as an opportunity to make money and the products do not support research OR help someone who is battling cancer. Yes they may give money to one organization or another but let’s face it, WE ARE ALL AWARE BREAST CANCER EXISTS we need to support research to STOP cancer from killing. Support someone in your life that is fighting the fight. Give a gas card or something practical. There are good organizations out there that support actual people and actual research. Please do your research and don’t support companies making profit off of my life or anyone else’s. We ARE aware. We need to DO more.